1. Mix the ginger, garlic, green chillies and soy sauce in a large bowl. 2. Add a pinch of salt and mix well. 3. Add the wings and rub well until evenly coated. 4. Cover the pan with a lid and keep it in the fridge for 4 hours. 6. Remove the bowl from the fridge. 7. Break the eggs into the bowl. 8. Add the cornflour and blend well until sticky and dry. 9. Add the chicken wings, one by one, to the hot oil and fry until golden. 11. Serve hot with mint chutney and chilli sauce. 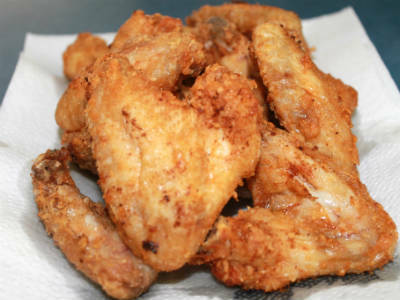 Feel free to comment or share your thoughts on this Deep-Fried Chicken Wings Recipe from Awesome Cuisine.